Before the release of Avengers: Endgame join us for a Marvelous night filled with challenging trivia and supercool superhero facts! 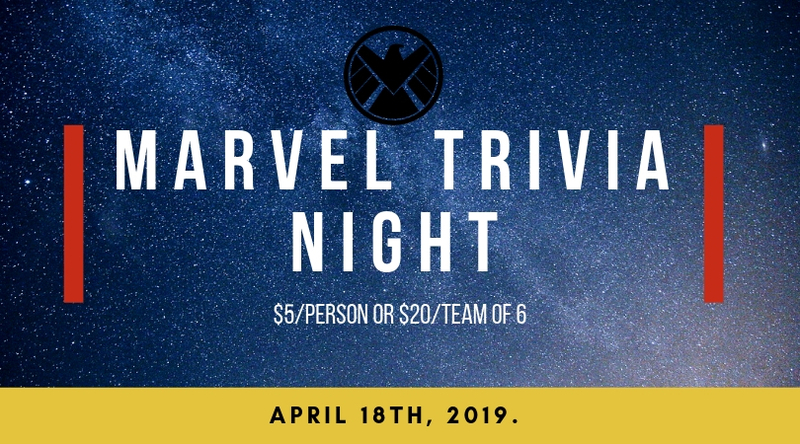 Make your team of 2-6 people and test your knowledge against your fellow Marvel lovers! We'll be covering the Marvel Cinematic Universe as well as the comics and kids and adults are welcome to participate. The event will be $5/person or $20 for a team of 6. We encourage you to sign up with a team in mind as we'll be assigning seats based on your team. Our Black Bear Cafe will also be serving up an incredible menu of superhero themed drinks - and you can even get a taste of what it's like to be a supervillian! Costumes are encouraged and the cafe will be staying open for the whole event to keep your snack cravings as crushed as the victims of Thanos' gauntlet. Ask a bookseller about signing up today!